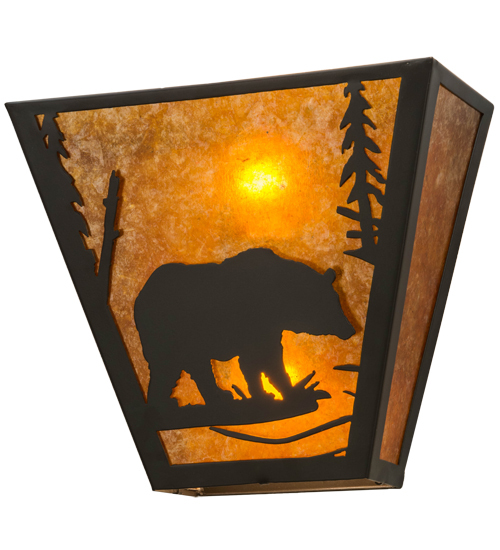 Description: Drawing inspiration from wildlife and the beauty of nature, this stunning fixture depicts a majestic Bear meandering through the woodlands as the morning sun rises in the background. Warm ambient light is evoked through stunning Amber Mica that is complemented with a frame and hardware featured in a Timeless Bronze finish. This pocket wall sconce is handcrafted by Meyda artisans in our Yorkville, NY facility, at the foothills of the Adirondack Mountains.